Upon entering the Milwaukee Brewers’ organization and permanently transforming himself from starter to reliever in 2008, John Axford has garnered a reputation for being one of — if not the — best closers in all of Major League Baseball up to this juncture. Utilizing his exceptionally effective three-pitch mix of a mid to high-90s four-seam fastball, power-curveball and swing-and-miss inducing slider, the 29-year-old managed to successfully closed the door in a staggering 93 percent of his save opportunities (70-for-75) since becoming Milwaukee’s full-time closer midway through the 2010 season up until the end of his 2011 regular season. During that same time-span, Axford also won 10 of 14 decisions, posted a 2.14 ERA (2.27 FIP, 2.82 xFIP) and 1.16 WHIP, held batters to a .209 batting average while strikeout out exactly 11.1 batters per nine innings pitched. For what it’s worth, the Ontario, Canada native accounted for exactly 3.9 wins above a replacement-level player between in that timeframe. Given how admirable Axford has performed in each of his last two seasons, the average baseball fan would have no other choice but to expect for him to perform as well as or possibly even better his following season. But as just about any Brewers fan would tell you, that simply hasn’t been the case. As the 2012 All-Star break inches closer and games only continue to become more important, one could make the case that the Prince Fielder-less Brewers have managed to tread water in the NL Central divisional race not because of their all-world closer, but in spite of him. In 29 appearances, Axford has won just one of four decisions and carries a repulsive 5.60 ERA (3.67 FIP, 3.36 xFIP) and 1.57 WHIP, walking nearly six batters per nine innings pitched while converting just 12 saves in 16 opportunities. The only positive that can be taken away from Axford’s performance this season would have to be his strikeout capacity, which has witnessed a tangible increase from 10.5 K/9 last season to 12.5 K/9 so far in his current campaign. However, Axford’s statistical regressions on the bump extend well beyond the often overemphasized rudimentary statistics. If you were to take a look at what hitters have done against him this season compared to that of 2011, you’d quickly find more areas for concern. The following table (statistics provided by Fan Graphs) attempts to delineate those regressions. Taking a look at this table, it’s easy to see that batters have had much more success against Axford’s stuff this season compared to last season. Save for the depression in his fly ball rate and subsequent improvement in his ground ball to fly ball ratio, the numbers clearly suggest that batters are, well, hitting his pitches at a much more frequent rate. The two biggest areas of concern presented by the table should be the spike in his line-drive rate and his perplexing infield fly-ball rate. A high line-drive rate of his magnitude is concerning, because it says that the pitcher — Axford, in this case — is leaving the ball over the plate and in the strikezone on a much too frequent basis. The league-average for line-drive rates, according to Fan Graphs, is 20 percent, which Axford is clearly well above. His infield-fly ball rate of 0.0 percent also falls well-below the league average of 10 percent. Generally speaking, a high infield fly-ball rate says that hitters aren’t making good contact with the ball, which can often be accredited to a pitcher having great command of his pitches or that his offerings have great late-breaking movement. Of course, what makes Axford’s statistical decline so difficult to understand–this is where is gets a bit confusing–is that hitters are actually putting the ball in play at a lesser overall rate this season juxtaposed to 2011. According to Fan Graphs, hitters have garnered a contact rate of 75 percent off Axford this season compared to a contact rate of 77.3 percent last season. More specifically, each of his pitches have witnessed a decrease in the rate of which they are put in play. The chart below (provided by Texas Leaguers) is a breakdown of Axford’s in-play rates from last season. While there isn’t an overwhelming discrepancy between his in-play rates from last season and those from this season, these tables are proof that Axford has actually been better this season than last to some degree. As you can see, he’s become more dependent on his fastball compared to last season and has consequently used his slider to a much lesser degree. Whether the obvious decrease in his slider usage is due of a lack of confidence or is completely purposeless will be determined at a later date, however, there’s no denying that something’s affecting him. Statistics aside, though, Axford has clearly labored through the first couple months of the season. Most of his struggles have come from the fact that he’s leaving the ball in the strike-zone at a much more frequent rate, and that has consequently worked against him as hitters continue to put the ball in play with solid, line-drive contact. 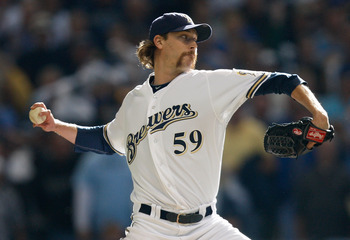 Not to say that Axford isn’t the pitcher he was a year ago, but he sure hasn’t looked the same. Needless to say, the Brewers will need him at his very best if they have any intention of returning to postseason action. The Milwaukee Brewers have answered nearly all of the question marks that faced them coming into their 2011-2012 offseason, and now wait in anticipation for spring training to commence roughly two months from now. Let’s take a look at how their lineup might look on opening day 2012 against the St. Louis Cardinals. Nearly half of Corey Hart’s plate appearances last season came as Milwaukee’s lead-off man but I suspect 100 percent of his at-bats to be at the top of Milwaukee’s order on opening day against the Cardinals. Roenicke toyed with a number of players at lead-off before Hart returned to the lineup from an abdominal strain in late April but none definitively fit the role. In 256 at-bats at the top of Milwaukee’s order, Hart posted a .301 BA, 15 HR, 36 RBI, 47 runs as well as a .366 on-base percentage, roughly comparable to Jose Reyes’ .388 from a season ago. Many feel the Rickie Weeks is best suited here as he clearly has the most background at the top of Milwaukee’s order. 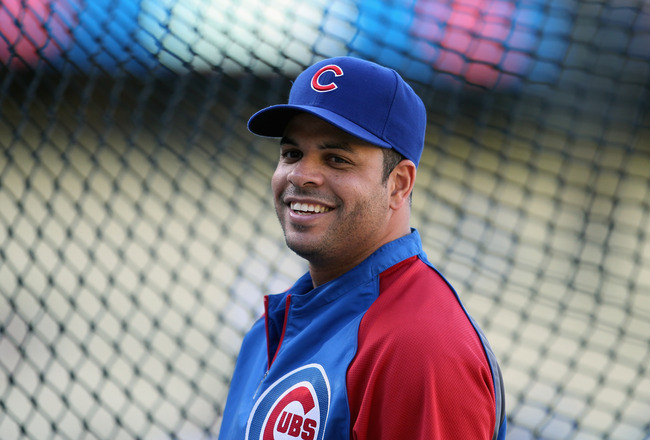 However, Aramis Ramirez will need adequate protection and Weeks’ game is slowly converting to power first, speed second. Hart is the right man for the job. Nyjer Morgan may be best suited to be a lead-off type hitter, but there’s simply no ignoring what he accomplished out of the No.2 hole last season. In 429 total plate appearances, Morgan spent 352 of them in batting second — exactly 82 percent. In that role, he batted .310 with 2 HR and 31 RBI, 46 R and a .353 on-base percentage that finished as one of the best OBP in the National League. With either Adam Wainwright or Chris Carpenter, both right-handed, likely to take the mound for St. Louis, expect Morgan to get the nod over Carlos Gomez strictly because of Morgan’s left-handed bat. No matter what the final verdict is on Ryan Braun’s alleged PED-usage, GM Doug Melvin says he is going about his normal business as through he expects him to be in the starting lineup on opening day. So, we’ll do the same. Do you really need an explanation? Aramis Ramirez has lingered in either the third or fourth spot for most of his career, and since the No.3 spot is already taken, it seems almost a foregone conclusion that he’ll bat cleanup next season. Out of the cleanup spot last season with the Cubs, Ramirez batted .291 with 8 HR, 32 RBI and a .450 slugging percentage in a feeble Chicago lineup. While we shouldn’t expect him to completely fill Fielder’s shoes next season, we should expect a solid middle-of-the-order bat that can protect Braun. Anything short of a .275 BA, 25 HR and 85 RBI would be considered inadequate on Ramirez’s behalf. Gone are the days of Rickie Weeks being Milwaukee’s lead-off man. At 29 years of age and a bevy of past injuries, he’s clearly entering the second phase of his professional career in that he’s much more of a power-first, speed-second type player. Last season, Weeks amassed 20 home runs and 49 RBI with a .269/.350/.468 line despite missing a substantial chunk of his season due to a ankle injury. With Prince Fielder gone and Ryan Braun still facing a 50-game suspension to start his season, Weeks will much more better suited to be batting either fourth or fifth in Milwaukee’s lineup. He has the potential to hit 30 or possibly even 35 home runs next season and should be the one protecting Aramis Ramirez new season. Incumbent 26-year-old prospect Mat Gamel has accomplished just about everything there is to accomplish in six minor-league seasons, but filling the shoes of Prince Fielder at first base won’t be a cakewalk by any means. Last season in triple-A, Gamel managed 28 home runs and 90 RBI with a .310/.372/.540 line. Impressive to say the least, but he’ll need to vindicate his career .222 BA and .309 OBP with the Brewers in a timely fashion. Batting behind Rickie Weeks is most likely the best spot for him on opening day. He’ll be a modest defensive upgrade from Fielder but don’t expect him to be a gold-glove caliber first baseman as he’s been known to be a bit lackadaisical from time to time. One of Melvin’s preeminent goals of this offseason was to upgrade at shortstop. He accomplished just that in signing Alex Gonzalez to a one-year, $4.25 Million deal with a $4 Million 2013 option. 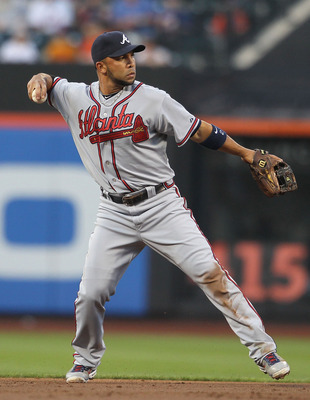 During his 12-year career, Gonzelez has become one of the best defensive shortstops in baseball, harboring a .981 fielding percentage and 5.938 zone rating last season at 33 years of age. His hustle in the field will manifest itself early next season, and will be a noticeable upgrade from Yunieksy Betancourt. Gonzalez’s pop at the plate has diminished, but he will still be held accountable to at least a .250/.270/.390 line next season. He has experience batting just about anywhere in a lineup, which will make Roenicke’s job that much more easy. Jonathon Lucroy is by no means a superstar talent behind the plate nor in the batter’s box, but 2011 certified just how important he is to Roenicke’s ballclub. Last season, Lucroy committed just seven errors on his way to a .993 fielding percentage — a commendable feat given Milwaukee’s league-high 70 wild pitches from a season ago. He also posted a 7.87 range factor that ranked fifth-best among all MLB catchers. At the plate, he managed a .265 average with 12 HR and 59 RBI, but garnered a 21.2 K%. Improving his plate discipline and on-base percentage will be key moving forward. Expect him to be in the No. 8 hole on opening day nonetheless. 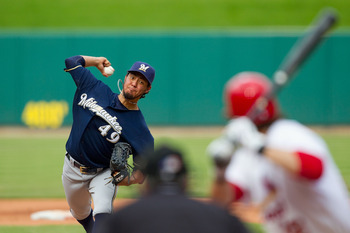 Yovani Gallardo is just 25 years old and will enter his third consecutive season as Milwaukee’s No. 1 starter. When it’s all said and done, he’ll probably be the greatest pitcher in franchise history. Last season, he went 17-10 with a 3.52 ERA while striking out 207 in 207.1 innings (33 GS). He led all Brewers starters in wins, ERA, and strikeouts and finished with a better K/9IP (8.99) than AL MVP Justin Verlander (8.96). Each year Gallardo continues to better every facet of his game and I suspect him to take the next step and lower his ERA to 3.20 or lower in 2012. There’s really no question as to who will take the mound for Milwaukee on opening day. Alec Dopp covers the Milwaukee Brewers as a featured columnist on Bleacher Report. 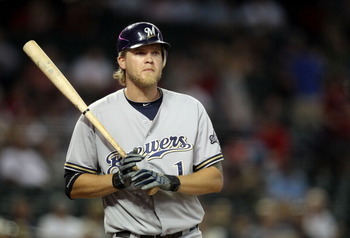 Follow him on Twitter @alecdopp and read his blog, Brewers Rumors. The Milwaukee Brewers are both literally and figuratively firing on all cylinders. Taking game one of the 2011 NLDS by a 4-1 mark Saturday afternoon, Ron Roenicke and his suddenly hot-hitting crew took to Miller Park on Sunday afternoon with high expectations…possibly too high. Milwaukee slugged their way towards a 9-4 victory over Kirk Gibson and company behind Zack Greinke — a man who has yet to lose at home this season. Here’s five key observations to take away from games one and twp with the series now shifting to Arizona. Seldom has Milwaukee put together such a valiant effort against top-notch pitching in consecutive games in 2011, but, then again, isn’t this the postseason? In games one and two, everyone in Ron Roenicke’s lineup seemed to be contributing toward a winning cause, leading to Milwaukee’s weekend sweep of Arizona. On Saturday, the Brewers dismantled Cy Young-candidate Ian Kennedy to the tune of four runs on eight hits in just 6.2 innings of work. Sunday was much the same, as Milwaukee got to 24-year-old Daniel Hudson, putting up five runs on nine hits in 5.1 innings of work. I would be sweating if I was Charlie Manuel right about now. Unimpressed with Casey McGehee’s performance at the end of the season, Brewers manager Ron Roenicke elected to put veteran and utility-man extraordinaire Jerry Hairston in at the hot corner to start the series. Needless to say, the move payed off handsomely. In game one, Hairston managed a sacrifice fly to center field that would score Ryan Braun in the fourth inning, breaking what was then a magnificent pitcher’s duel. He would also make a few key put-outs at third base during the game, as well.On Sunday afternoon, No. 15 worked his magic once more. Going 3-for-4 with a run scored, Hairston was an essential piece to Milwaukee’s puzzle in taking both games at home. Trevor Hoffman, you’ve done well. In his first go-around as Milwaukee’s full-time closer, John Axford has performed above what anyone could have expected. He hasn’t blown a save since last spring, and he’s only now getting recognition for it. The former cellphone salesman and bartender set a franchiser record for saves in a season (46) in 2011, and quickly transitioned his regular-season success to the postseason. On Saturday, Axford worked a one-two-three ninth inning including a strikeout against Arizona. 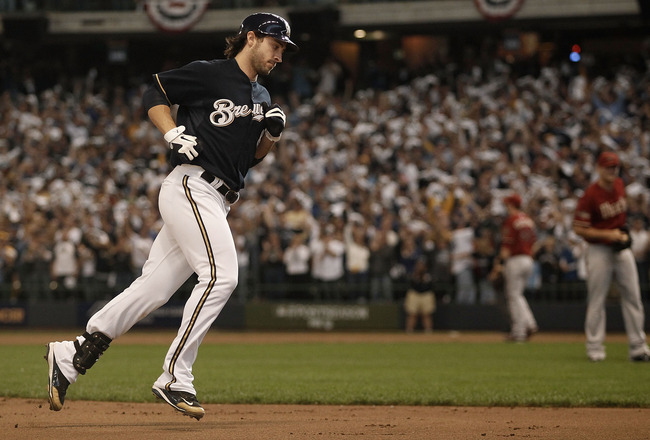 Sunday was no different, as Axford closed the door in the ninth inning with two emphatic punchouts to put the Brewers up 2-0 in this 2011 NLDS series. What Yovani Gallardo has been able to accomplish in just four complete seasons as a starter for the Brewers is nothing short of spectacular. However, it may be what he has yet to achieve that will be most impressive. In his first truly meaningful postseason start, the 25-year-old Gallardo went the distance, administering nine strikeouts and just four hits in eight innings of work while giving up just one run. 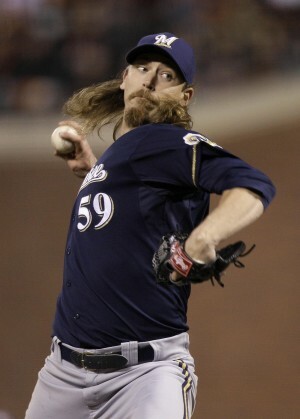 His outstanding performance would make John Axford’s job a whole lot more easy. If he can keep this pace up, the Brewers should like their chances against either Philadelphia or St. Louis in the NLCS (assuming they make it that far). Just kidding. We knew this after his first big-league game. 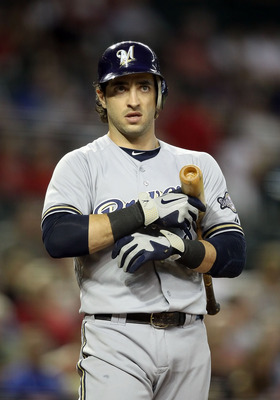 It’s hard not to be in complete awe of what Ryan Braun brings to each and every at-bat. One of the few traditional five-tool players inMLB today, Milwaukee’s left fielder is showing what he can do on the brightest of stages. Through both games of this NLDS series, Braun has gone 6-for-8 with four runs scored, a home run and three runs batted in. Sorry, Matt Kemp. The NL MVP resides in Milwaukee.